On Friday June 5th at the Kim Engineering Bldg. 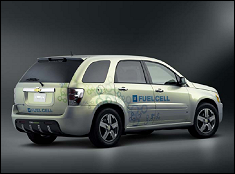 plaza, representatives from General Motors presented two hydrogen-fuel-cell-powered vehicles (Chevrolet Equinoxes). Interested legal drivers were given the opportunity to test drive a vehicle and gain a sense of how General Motors fuel cell vehicles have arrived. This promotion occurred in conjunction with the Hydrogen Seminar sponsored by Virginia Clean Cities (Chelsea Jenkins – Director) and presented by Profs. Greg Jackson (Mechanical Engineering) and Peter Sunderland (Fire Protection Engineering). The Chevrolet Equinox Fuel Cell Electric Vehicle is a zero-gas, zero-emissions vehicle that makes no compromises, achieving 0 to 60 mph in 12 seconds and a top speed of about 100 miles per hour. It seats four, sports 32 cubic feet of cargo volume, and has a range of approximately 160 miles per fill-up based on the new 2008 EPA adjusted measurement. The Equinox Fuel Cell also features many safety systems such as OnStar, four-wheel ABS, traction control, dual airbags and head curtain airbags. The fuel cell system fits within the space of the conventional engine compartment. The nickel-metal hydride battery pack, which stores energy from the regenerative braking system to increase operating efficiency and boost acceleration when needed, sits under the floor in the middle of the vehicle. Three compressed hydrogen storage tanks, made of carbon fiber for strength and pressurized to 10,000 pounds per square inch (psi), are located under the rear seats and cargo area. They contain roughly nine pounds (4.2 kg) of hydrogen. The Chevrolet Equinox Fuel Cell fascia sports Chevy’s horizontally split grille, along with extra cooling air inlets in the lower front corners. At the rear, the new fascia under the bumper has four thin vertical slits in place of the exhaust pipe; they release the clean water vapor emissions. Exterior graphics, including special badging on the lift gate, also call out the Equinox Fuel Cell, finished in either a premium tri-coat Glacier Gold or White. Under the hood, a special trim cover on the fuel cell system also sets the Equinox Fuel Cell apart from its conventional gas sibling. The plush interior includes a touch screen display in the center stack for the navigation system and power flow display. Instead of a tachometer, a power indicator is integrated into the instrument panel to show the actual power being delivered to the system in kilowatts (kW). The Equinox Fuel Cell shifter also includes an emblem signifying it’s a hydrogen fuel cell-electric vehicle. The Chevrolet Equinox Fuel Cell Electric Vehicle is a part of “Project Driveway” the world’s largest market test of fuel cell vehicles in 3 cities, New York, Los Angeles, Washington DC.